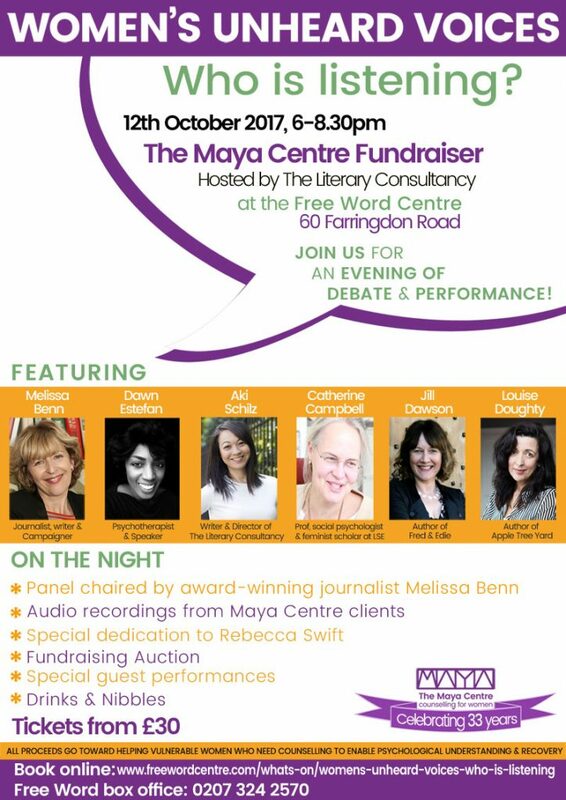 We are proud to announce The Literary Consultancy will be hosting The Maya Centre for a fundraising evening of stimulating debate and inspiring performance on the 12th October 2017. A panel to the theme of the evening, ‘Women’s Unheard Voices: Who is Listening?’ will be chaired by renowned journalist and broadcaster Melissa Benn. Joining her will be: acclaimed novelist Louise Doughty (Apple Tree Yard, now a major BBC series); Professor Catherine Campbell (LSE); Psychotherapist & speaker Dawn Estefan; bestselling author and writing mentor Jill Dawson (Fred & Edie, The Crime Writer); and writer and Director Aki Schilz (The Literary Consultancy). The evening will also include special live performances, and an exciting fundraising auction – previous years’ lots include flying lessons, original artwork, and writing retreats. There will also be audio recordings for guests to hear some of the results of the Maya’s unique therapy work with vulnerable women in Islington. The event is a cause for celebration, marking thirty-three years of The Maya Centre’s essential work. It will also pay special tribute to Rebecca Swift, co-founder of TLC, who sadly passed away in April 2017. Rebecca was a loyal friend and trustee of The Maya Centre for 10 years up until the end of 2015. Her work with The Maya Centre was underpinned by her commitment to enable women to tell their stories – a commitment at the core of her thinking when conceiving of the idea for TLC whilst working as an editor at Virago Press in the 1990’s. Rebecca cared especially about good quality counselling for the women in desperate need of being heard and psychological healing.